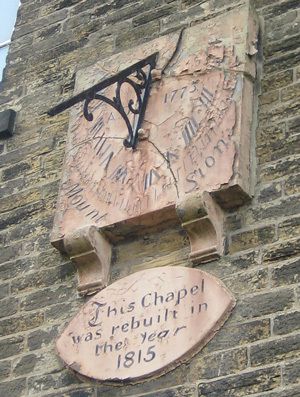 The only remains of the 1773 building are the sundial on the front of the building and the foundation stone from the first building. 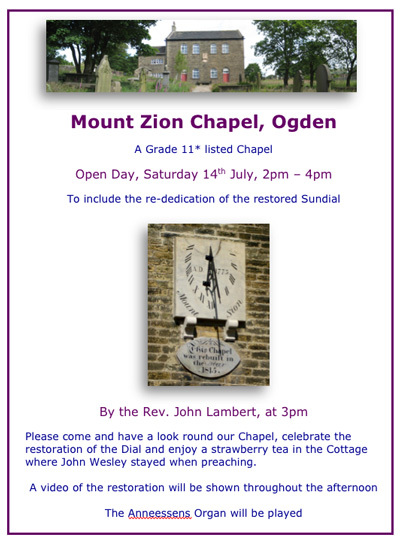 "For the clock, is an ancient sundial which has long been a pride of Mount Zion congregation. The congregation has a lot to be proud of. Besides the sun dial the Church has a beautiful interior and boasts a Belgian organ, of which there are about six remaining in this country". 1990 First issue of the twice-yearly MZ magazine "The Dial", prepared by Murial Jagger, Friends of MZ secretary and treasurer. 21st November 2011. 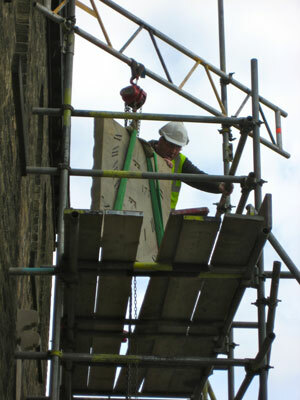 The scaffolding is erected to restore the Dial. 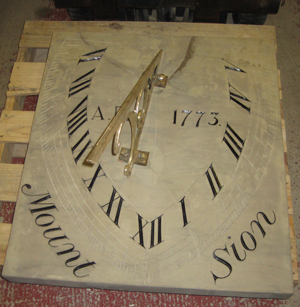 More pictures showing the status of the Dial restoration. 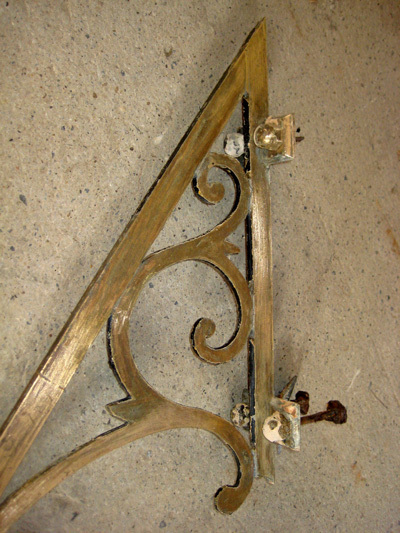 It is now re-assembled and when the gnomon has been repaired and painted black, it will be ready for installation! 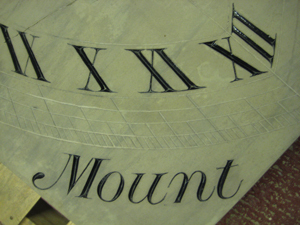 The Dial is almost ready to be refitted to Mount Zion. 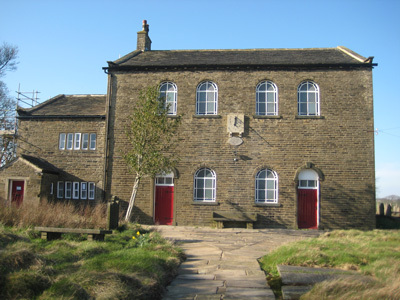 Mid March 2012. The Dial is coming home! March 28th. 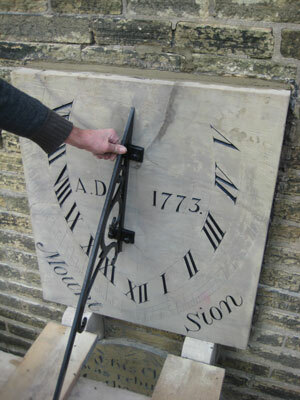 2012 The Dial is restored! 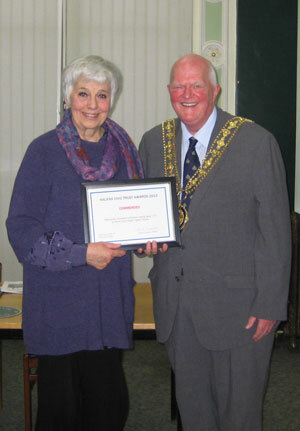 Mount Zion is awarded a 2013 Halifax Civic Trust Commendation for the work in restoring the Sundial. Rosalind Greenwood, John Hargreaves, John Hardy (Mayor), Lord (Hugh) Somerleyton. 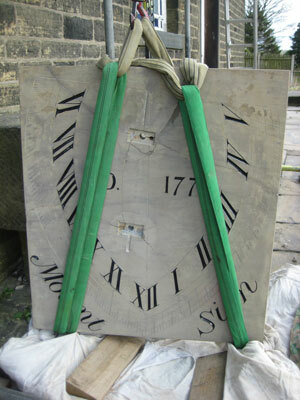 With the help of a grant from Methodist Heritage, it was decided to restore the sundial in 2011/12. 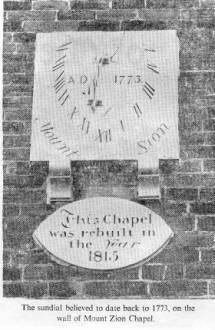 The sundial dates from the time the first chapel opened in 1773. 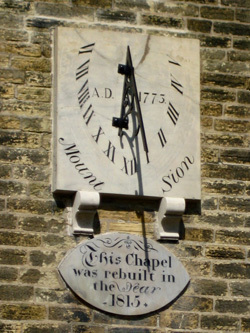 When the chapel was rebuilt in 1815, the sundial was placed in a prominent position on the façade. 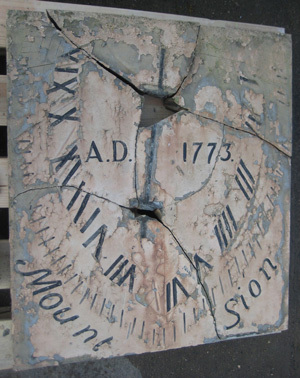 After nearly 240 years exposed to the Pennine weather, the sundial was in very poor condition. 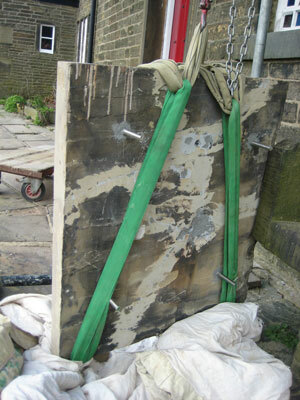 It had broken into six pieces and was in danger of falling off the wall. 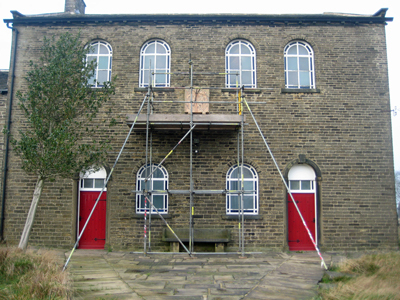 Andy Barraclough of Crossley Stonecraft was called in do the restoration. 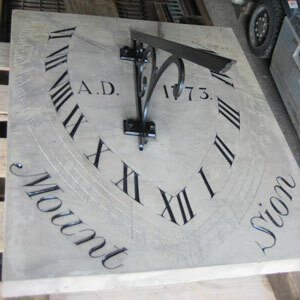 He removed the six chunks of sundial from the wall and transferred them to his workshop. There he first removed the many layers of old paint. This exposed the very fine original carved detail hidden underneath. 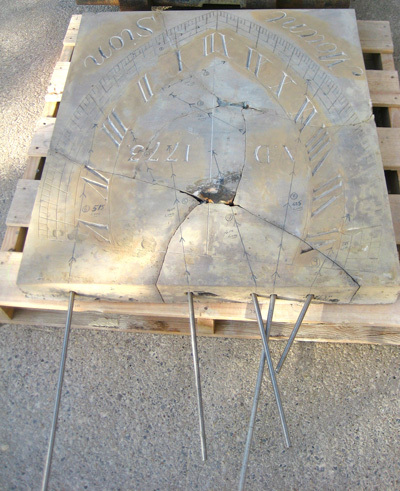 The six pieces of stone were then painstakingly stitched together using stainless steel rods inserted into holes drilled from the top of the sundial and filled with an epoxy resin. 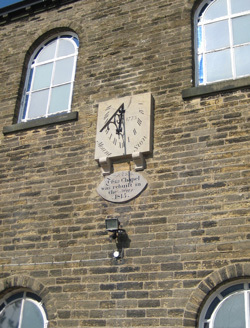 The lettering was repainted black and the gnomon was cleaned, repaired and repainted. 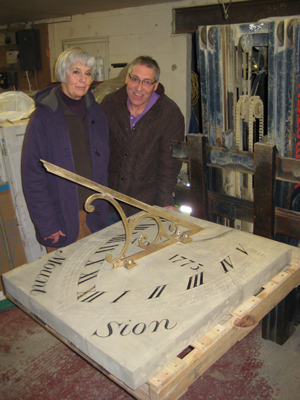 The sundial was returned to it’s place on the façade, and rededicated at a special service in July 2012 by the Rev. John Lambert. 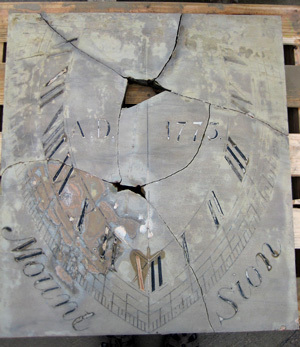 A timely restoration of a precious piece of Methodist history which may well last another 240 years!